Jack Dorsey-led payments tech firm Square (SQ) posted its fourth-quarter 2018 earnings after the closing bell on Feb. 27. Total net revenue soared 51% year-over-year to $932.5 million in the three-month period, while quarterly net loss widened to $28.2 million from $15.6 million loss a year ago. Net diluted loss per share was at 7 cents. Adjusted net income grew to 14 cents a share vs. the year-ago profit of 8 cents per share. Adjusted revenue jumped 64% year-over-year to $464.2 million. With this earnings announcement, Square has beaten earnings estimates in the past nine quarters. The Street was estimating earnings between 12 cents and 13 cents a share on revenue of about $454 million. Gross payment volume (GPV) — the company’s major operating metric — for the quarter was 23% higher at $28 billion. Transaction-based revenue was $668 million, up 27%. Subscription and services-based revenue soared 144% to $194 million. Subscriptions and services-based revenue was primarily driven by Instant Deposit, Cash Card, Caviar and Square Capital offerings. Despite the consensus beat, Square stock fell in after-market trade following the announcement, indicating that shareholders are not amused by the outlook for the upcoming first-quarter. 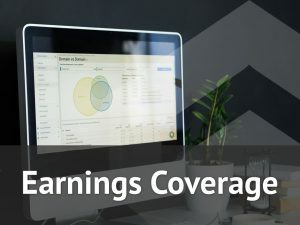 For the first quarter of 2019, Square sees total net revenue between $918 million and $938 million, generating a net loss between 10 cents and 12 cents a share. Adjusted earnings is expected to be 6 to 8 cents per diluted share. 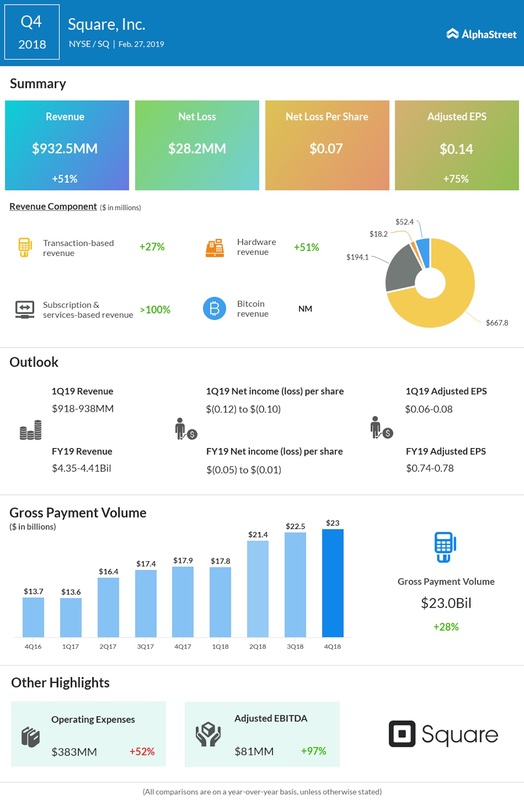 For the full-year 2019, Square is looking at total net revenue of $2.22-$2.25 billion, with a net loss between 1 cent and 5 cents a share. Adjusted earnings for the year is touted to be 74 to 78 cents per diluted share. When it took off, Square was the answer for street vendors and small business orders to accept credit cards using the phone’s 3.5mm audio port. It soon made a mark and quickly ventured into microfinancing and even Bitcoin trading. In January 2018, bitcoin trading was launched in its Cash App, available throughout the US excluding few states. As of today, the Cash App has over 15 million active monthly customers. The application also features in the ‘Top 20 Free Apps in the U.S. App Store’ list.